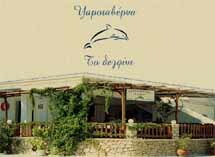 Tavern "Dolphin" is located in one of the most beautiful places of the island, at the natural port of Finiki. You will find fresh fish, spaghetti with lobster, Karpathic cheese and other local dishes. You can also taste the wonderful wines, enjoying the view of the sea. Next to the tavern , there are three wonderful studios with air-condition, T.V., kitchen and a panoramic view to the sea.